Audiobooks.com launched last January with the goal of offering an all-you can-listen audiobook service for $25 a month. Unfortunately it seems that customers weren't that interested in the possibility because today this lesser competitor to Audible has announced a new plan which offers the same type of subscription as Audible. Under the terms of the new plan, customers can sign up for a subscription that will let them buy one title a month for a monthly fee of $15. There's a second more expensive option for 2 titles a month for $22. This service offers a catalog of 25 thousand titles and is only a quarter the size of the Audible catalog. The DRM is in some ways friendlier, though it is still heavily restricted. 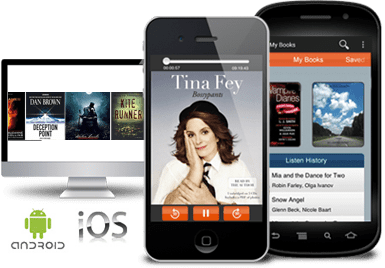 Customers can only stream content in most web browsers, and they can download up to 2 titles at a time to Audiobooks.com's Android and iOS apps.There's no real option for downloading a DRM-free audiobook (not that I can see), an option which Audible offers in a limited form (you can burn a title to a CD). Audiobooks.com says that the launch of the new subscription plan underscores "Audiobooks.com’s commitment to continuous innovation to meet audiobook listeners’ needs." In other words, they are innovating by copying the dominant player in the market, Audible. Late last week Violet Blue posted an open letter asking Amazon to drop DRM from Audible content, citing (among other arguments) the fact that Audible pretty much dominates the audiobook market. Services like Audiobooks.com make it clear why that continues to be true. Between the catalog size, features, and restrictions, there's little to recommend this service over that of Audible. No wonder everyone continues to shop at Audible; it's basically the Kindle Store for audiobooks.